This graphic novel uncovers the romantic and idealistic notions which Castro inspired in others, and which were eventually crushed as his long, oppressive reign lingered on. 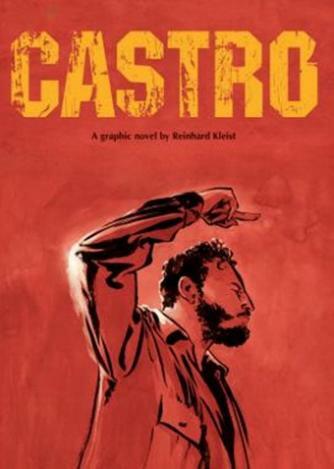 Castro, a graphic novel by illustrator Richard Kleist and writer Volker Skierka, portrays the meteoric rise of Cuban leader Fidel Castro. In many ways, the making of this graphic novel was risky business for illustrator Reinhard Kleist, the man behind the highly successful Johnny Cash: I See a Darkness (2009). Not merely because, in his prime, Fidel Castro was a controversial figure through his years of Cuban communist rule, nor even because in Western eyes he was often overshadowed by, and somehow less admirable than, the motorcycling socialist, turned Warholian pop image carnation, Che Guevara. No, it’s more than that. It may be because in times of million dollar campaigns to promote pop-up political leaders, we aren’t often reminded of Fidel and his Cuban roots. Indeed, starry eyed and blinded by Obama’s charisma and the relentless media machines of other well groomed candidates, we may have forgotten to care who on earth Castro was and what he tried to do to Cuba. Though, luckily, the German journalist and Castro biographer, Volker Skierka, decided to team up with Kleist and remind us in this gem of a collaborative title. Kleist uses Volker Skierka’s work Fidel Castro: A Biography and brings it to life, telling the story of Castro’s youth and his development into the leader of the Cuban revolutionary movement during the 50s and early 60s. Over three richly illustrated chapters, bookmarked by somewhat of an intense prologue and epilogue, we witness Castro’s life, right from his first pangs of intellectual rebellion during his educational period; his manifesto wavering, communist crowd gathering years; his fall out with America, then Russia, and eventually many of his followers; through to his whimpering yet stubborn decline. The book should be a welcome addition to both graphic novel fanatics’ bookcase as well as any political nut. Castro is clever enough to focus on the most interesting part of the Cuban revolutionary: his ability to stick to what he believed in, no matter what. Delusional or courageous? Whatever your view, one thing is for certain: Castro is worth thinking about and remembering; not only because you won’t see a camera-cleansed Cameron smoking cigars like those, but because he still manages to divide opinions. This text which captions a whole page in the first chapter of Castro, and is spread across expositional landscape of Cuba, is one which intimates the core elements of this story: the nature and relation of fate and power. These two main themes inspire the graphic novel’s main thrust and form the basis of the story almost as much as the interweaving lives of the two main characters. One of these main characters is Fidel, while the other is a fittingly nameless photographer/ journalist, who we follow all the way through the book, as he retains faith in the revolution, meets a companion and tries to make a living out of his articles and pictures. Meanwhile, Castro loses friends, becomes increasingly irrational and starts booting anybody out that doubts his ever-fading communist ideals. Needless to say, things get very sticky indeed, as political paranoia begins to sweat its way into the heart of an already sweltering and socially disjointed Cuba. If our snap hungry, journalist narrator is a little archetypal and plain, it’s only because the permanently frowning, vote-catcher Fidel is effortlessly captivating and such a large presence throughout. Quite literally too: the images of Fidel — whether in heated debates with a president, or inhaling a signature Cuban cigar — are often spread over full pages. The countenance and emotional subtlety throughout some of the most uncertain and wonderfully nail-biting, back-stabbing parts of the book are masterfully captured by Kleist’s deeply tonal technique. That’s not to say that writer Skierka doesn’t play his part in carving this out to be as engaging as it is aesthetically pleasing. What Skierka’s managed to do well is layer the story fairly. 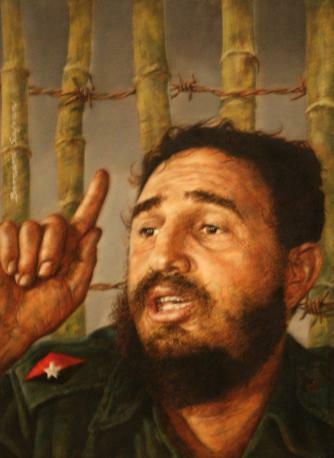 He balances out allegorical strands of politics, media, conflict, marriage, love and illegitimate babies with the kind of level headed harmony Castro himself might have benefited from at times. And the book never feels like a piece of propaganda either, but rather, an intellectually stimulating take on an important part of the world’s history. 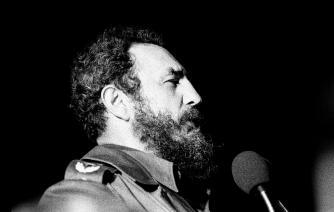 Although Castro is arguably stuck in his views, to an irrational extent, one would be hard pushed to call him untruthful. This, in an age where first world political candidates often spout any bending of the truth just to enable a good sound bite, is an endearing quality by anyone’s standards. However, being that as ties fade with Russia, food supplies and infrastructures virtually cave in, perhaps it wasn’t power that got in the way of Castro’s vision after all — but pride. One of the most surprising elements of the book and its portrayal of Castro, is that despite him being grounded in a purist communist ideology, losing followers and overseas support, as well being arrogant at times, we never get a sense — at least not a malicious one — of corruption. In fact, the book does very well at presenting the facts, never pulling the reader’s views to one side, and somehow remaining eminently exciting.